Only the hairless parts of the body —- the inner surfaces of the hands and the soles of the feet —- are covered with patterns formed by raised ridges of skin known as friction or papillary ridges. The study of fingerprints, or dactyloscopy, forms only one privileged section of the wider of lophoscopy: dactyloscopy is the more widely used section in practice even though prints from the soles of the feet are as characteristic as fingerprints, they are less often used for identification purposes due to their low rate of occurrence. The patterns formed by the papillary ridges are important since they are already formed in the foetus by the fourth month of pregnancy and they do not change until death. These patterns cannot be altered, except by accident, mutilation, or very serious skin desease, as they are formed in deep layers of the dermis. The skin consists of two main layers: the outer skin or epidermis, and the inner or true skin, known the dermis. The epidermis is constantly being worn away and replaced by new skin generated by the upper layer of the dermis – a papillary layer (stratum mucosum) which is the source of the ridges known as ‘papillary ridges’. 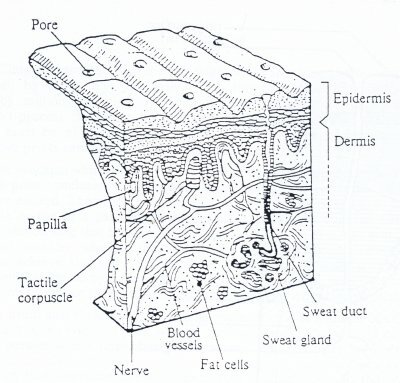 The sweat glands, located in the dermis, discharge sweat at the skin surface through sweat pores found at the top of the ridges. Such pore holes are critical to the production of latent prints since sweat reaches the surface of the hand and efficiently coats the tops of the fingerprint ridges with sweat. 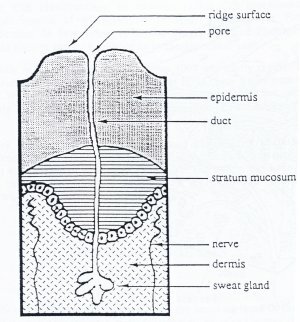 Sweat glands serve as small chemical reservoirs and contain a variety of water-soluble chemical compounds, produced or stored by the body. The dermal layer of the skin also contains the nerves of touch which terminate at the underside of the epidermis. The epidermis contains no nerves but does contain nerve endings. Fingerprint patterns are not formed at the surface of the skin but are determined by the arrangement of various elements, such as sweat glands, nerves, and blood vessels found below the surface of the skin. Sebaceous glands and hair follicles are found in the dermal layer of other skin surfaces but are absent in friction skin. Should the top layer of skin suffer any injury, the ridges grow back after healing in the exact pattern they had before. Therefore, superficial cuts or abrasions alter fingerprint characteristics only temporarily. If the injury reaches deep into the dermis and destroys the dermal papillae, then growth of new epidermal cells is impaired and a permanent scar is created. Fingerprint detail is unique and individual for a given finger, even if two fingerprints may be similar, as is the case with identical twins, since the detail in a fingerprint is formed in an accidental manner during gestation. Wilder and Wentworth followed by Cummins and Midlo were pioneers in the study of ridge morphology and gave numerous indications on the formation of papillary ridges. From the third month of foetal life, bumps or points develop at variable rates on the tactile surfaces, with each point containing a pore. These fuse together as lines to give the papillae. The general pattern is influenced by heredity, but this is not the case for papillary minutiae as these are the result of stress and variable pressure on the tactile surfaces when the points fuse into lines. The ridge characteristics that make fingerprints unique are known as minutiae, Galton points, characteristic points or points of identification.